Urban architecture has come to encompass a growing number of walled-up houses and buildings, a consequence of real estate bubbles, speculation and crisis, which triggered countless, and global, foreclosures and liquidations. Once the occupants are evicted, properties are typically walled-up to keep trespassers away, becoming entirely devoid of their sheltering role. In this architecture, bricks are used to shut rather than build, putting the construction in pause or perhaps signaling its death. Nothing good can be expected from these heartless measures, even if closing off the entrances of buildings is by far a less cruel practice than immurement, an ancient form of capital punishment where the prisoner was literally walled-in and left to die. One casts out, while the other locks in, but both lead to great suffering and despair. Walls such as these appear as the contemporary sign of the condemned. Human interaction with architecture is at the core of the Romanian legend of Mesterul Manole, the master builder of the Arges Monastery, who immured his pregnant wife for the sake of beauty. Following the advise of an invisible voice, he was brought to sacrifice she whom he loved the most, tricked to her fate in order to lift a curse. Only then did he accomplish his masterpiece, the most magnificent monastery in Wallachia, which satisfied the prince, but also spared him from the very same fate he had reserved for his wife. This project responds to the multiplicity of social functions and symbolic values attributed to the wall, in particular when it loses its original purpose -to build- as it commonly does in our societies. Transposing the bricks to a softer support allows a more flowing relationship with architecture, one where the sign of urban demise and human tragedy may be observed from up close, yet kept at a distance. Closing the curtains may abolish the wall, but it also invites the experience of the dark and silent spaces on the other side. As urban dwellers, we’ve become accustomed to this useless architecture, the empty and abandoned spaces that proliferate in our cities. Perhaps we too are cursed and, like Mesterul Manole, we won’t accomplish our best unless our heart is crushed in the process. But a happier ending might also be at hand: to close off the curtains in order to hide, not as a punishment or a sacrifice, but as an escape in the name of art. 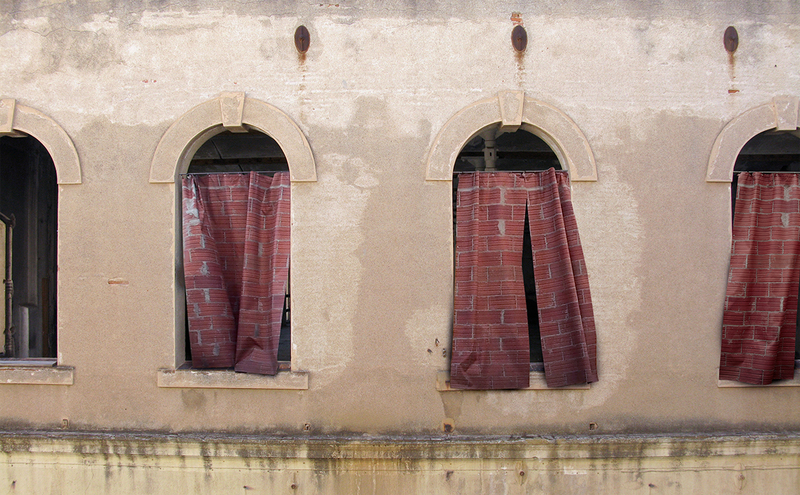 , 2015, series of 8 curtains with brick texture.